After the trip to CA, I was really messed up for a last few days. I was extremely tired (time zone/daylight saving changes) when I got back, the back was bothering and the after affects of the dental work all hit me at the same time. Ouch! The trip to LA was just exhausting in many ways and I was sure glad to be sleeping in my own bed again. I guess a bunch of factors all hitting at the same time just caused me want to relax since my head just wasn’t into the game. I needed to do a lot of thinking and reflecting. Thank goodness for good friends to bounce ideas off of. Felt like doing absolutely nothing on the plane…. Today, I finally started feeling perky again, physically and mentally and decided to get back to work. I want to get this bird out of the shop, so Pat can enjoy it. He will really love the great flying characterists of canards. What a great community too. 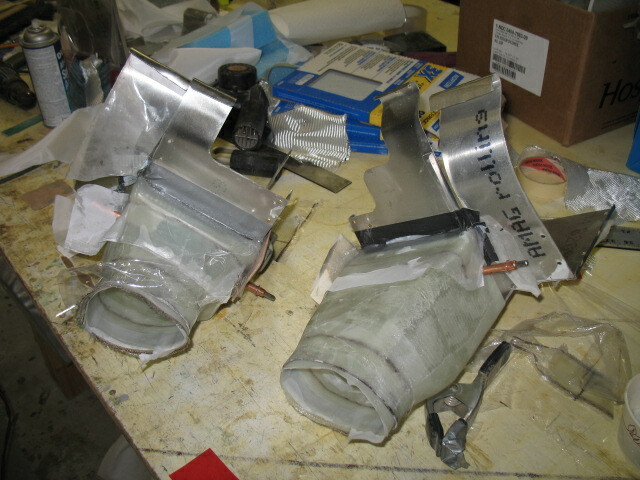 Before the CA trip the inlet ducts were glassed. You can see the AL ring installed in the duct work of the STBD side to clamp the flex hose on after assembly. 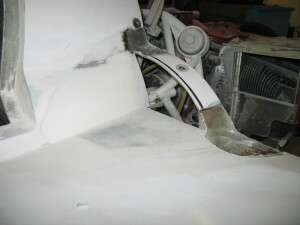 The port side after glassing. There is much more room to work with on the port side than the stbd side. 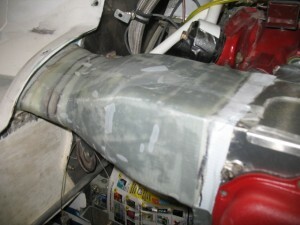 It is made a bit more bulky to allow the oil dip stick will penetrate this inlet duct. After removing all the foam and glass and cutting them free I found I could get them on/off the engine with forward baffles installed! Great now I can rivet the inlets to the Al air boxes instead of screwing them on as originally planned (it will look and perform much better). Some more glass work is necessary for fine tuning and I’ll be done with them. I took a quick trip to CA this weekend to see Pat and get some dental work started at his office. What an outstanding dentist! Absolutely the best I have been to in 30 years (actually I have only been to one other), but I know good outstanding workmanship when I see and experience it. He has increadable diagnostic technology and quickly pointed out the necessary treatment. It ended up 7 crowns needed to be removed due various flaws and issues. I think Pat took great joy at using his very cool digital miniaturized camera to wirelessly transmit the pictures to an overhead display monitor. I wanted him to put on a head camera so I could watch what he was doing too. Typically crowns can last between 10-25 yrs depending or many factors (type, hygiene, preparation, etc) and mine had reached the end their useful life. Fortunately, Pat caught all the things my regular (and now formal) dentist never diagnosed (he doesnt have the advanced equipment Pat has). Time for a complete rebuild! We took a quick trip to Las Vegas in a Cessna 172. Pat is a terrific pilot and the Garmin glass panel was simply breathtaking, but also a bit confusing for me. I would need more than 3 hrs to even begin to understand all of its features or how the software works. It would take some study and lots of hanger flying. Give me steam gages! I really like the simplicity of an EZ, but I found it interesting that my bird will do as much as the Cessna and has a few extra features the Cessna does not. Flying in a Cessna is SLOW too, we cruised between 100-110 kts at 9.5 g/h at 10k ft. With a 24 kt headwind a trip seemed to take forever. The EZ cruises at 150 kts at 6.5 g/h. I just love canards! The what great visiblity in Calif! 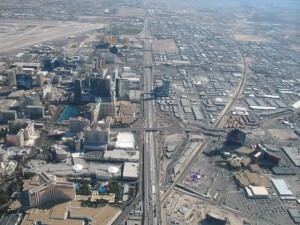 Las Vegas from the air.. While in Vegas, Pat wanted to see Steve at Eureka CNC foam cutting to discuss possibly marketing a blended winglet design I came up with. It is a very accurately cut blended winlet which includes the blend and the winglet. With a CNC cut core, the builder will not have to do any measurements at all to quickly build the winglet. Here is a picture of the miniture one I made in 1/2 hr to test my foam cutting procedure. It works great! Just assemble the foam blocks, micro the blend to the existing (or new wing) glass in the spar, do some foam shaping and glass the skin. Couldn’t be easier or more accurate since the foam block are engineered to be the support and alignment jigs. It has cutouts for the spar, wire chases and rudder. The great thing about my design is it very easy to build. 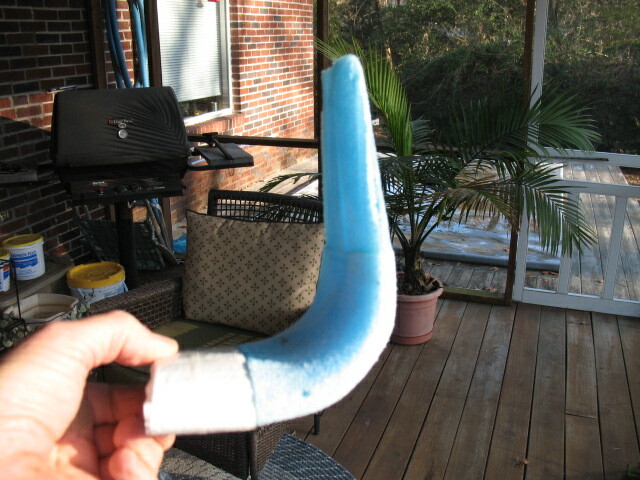 The GOOD aspect of my design is the construction process is much easier than building a standard winglet. 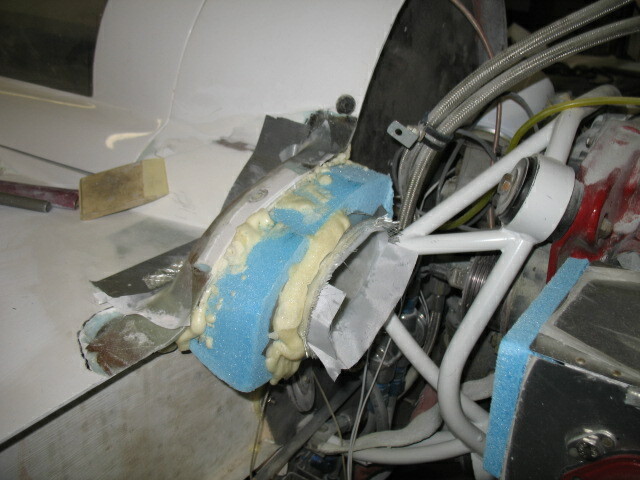 The BAD aspect is the foam wire cutting is very complex and requires the extreme accuracy of Steve’s CNC cutter to make it. VERY complex cutting movement with lots of slicing and dicing of the foam blocks. 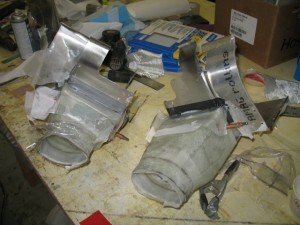 Once the engineering/tooling is done, it is quickly repeatable and cheap for the customer. Pat decided to pass on forming a partnership with Steve which is a very smart business move since the market is so small. No profit for us in it. I am sure you’ve heard the old saying about aviation, “If you want to make a little money in aviation, ……Start off with a lot of money”. So true. I plan to start working with Steve to get this blended winglet idea off the ground because I am going to build a set pPod. Afterwords, I’ll definitely be putting blended winglets on my plane (Tweety). I want to document the build, test fly the winglets, and compare performance data from all my previous test flying (which I have in excel). 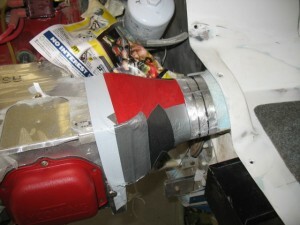 Before/after modification performance results…. I like that. If nothing else it will my my bird look 15 kts faster just sitting on the ground! After the meeting Steve and having dinner, we went to a few clubs and stayed out very, VERY late. It will certainly be an night I will never forget….ever. 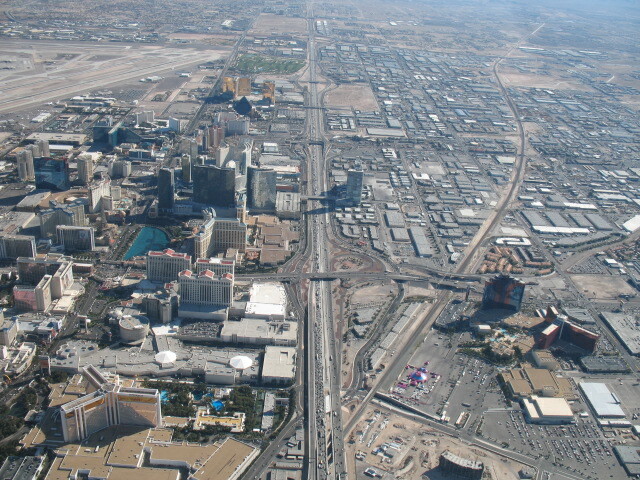 The much overused phrase, “What happens in Vegas, Stays in Vegas” could never be truer! So, dont ask me what happened because I’ll never tell. Mono e Mono. I would have really liked to have seen a stage show, the Blue Man group or just get more sleep (changing time zones is hell on the body). I was really pooped after our wonder dinner we had a an authentic Japanese restaurant! Oh, well. 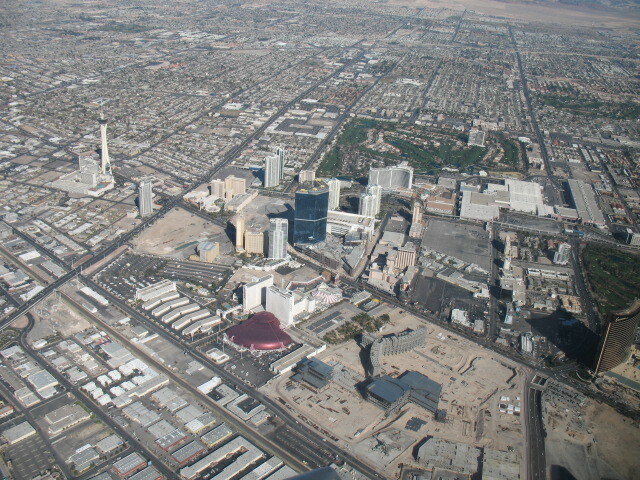 The next time I travel to Vegas, I have been invited to spend the night at Steve’s place and take in some of the great shows, look at casinos, or just walk the strip. It would be the best trip ever. Pat introduced me to a great guy he has known for a 20+ years … Kayto (Japanese). We had dinner with him the night before and after spending a few hours with him I got used to his thick accent. He was really cool! It was interesting to hear his perspective on living in the USA. 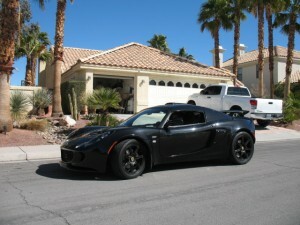 Kayto let Pat take his Lotus Elise on a a 45 minute test drive. Pat loved it! The cool thing is this go kart for the road sells for between $15,000-$35,000 on the used market. 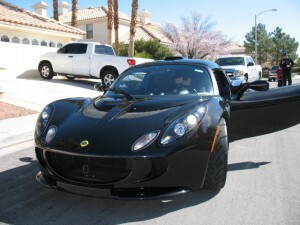 Talk about fast and fun to drive! 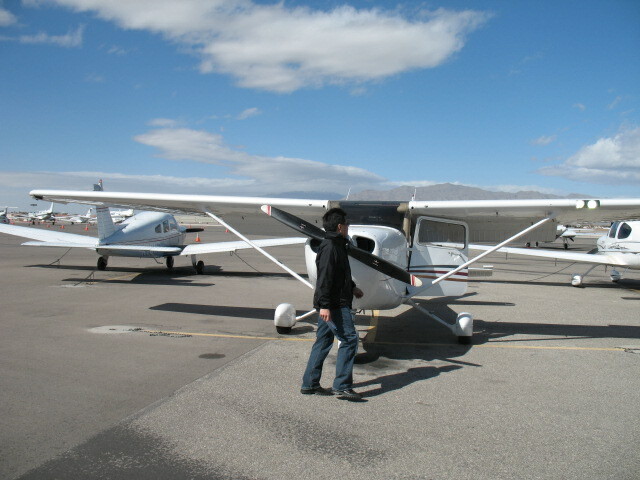 When we made it to the airport at 2 PM to leave, the winds were blowing at 28 gusts to 40 kts. Fortunately, it was blowing right down the runway. I couldn’t believe how the wind was beating the plane up on the ground. Pat made the take off look amazingly simple for such a windy day. 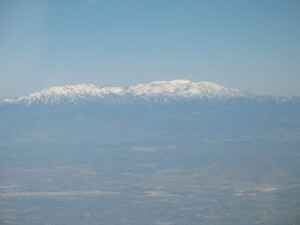 The flight back to LA was uneventful and very pleasant. The view of the desert country from the air is just incredibly beautiful. 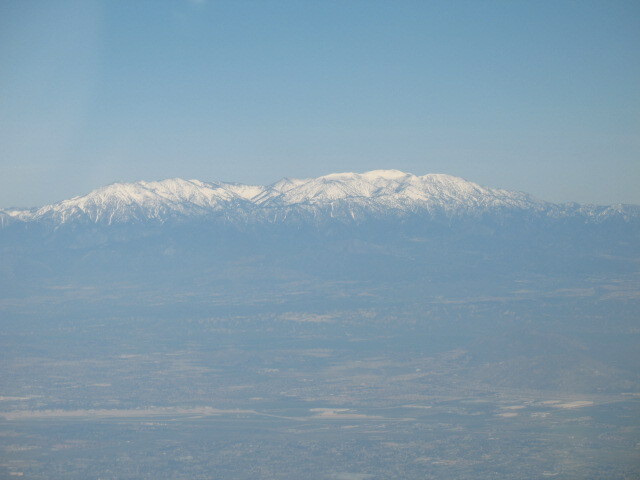 A quick 2.8 hrs later and Pat shot an expert ILS approach into LA. 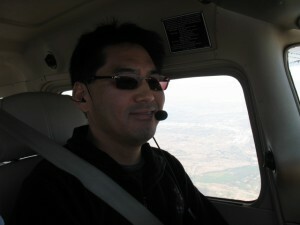 I cant wait until I can get back to Calif in a EZ to fly low and fast over this wonder desolate country side. On Sunday, I had a great day after church cutting up a downed tree and hand splitting the wood. 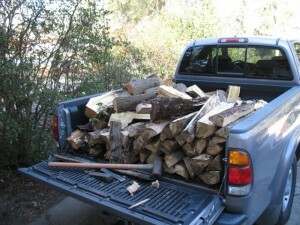 Actually it was a lot of fun using an ax instead of a log splitter. A bit of work but great exercise. I have shifted directions on the down draft cooling system. After carefully looking at the cowl, Pat and I decided that the reduction of the height above the cylinder (due to the DD cooling plenums) did not warrant chopping up a beautiful cowl. If I had not cowl it would be a different story. Overall, I would save a considerable amount of time by keep the cowls a close to original as possible. 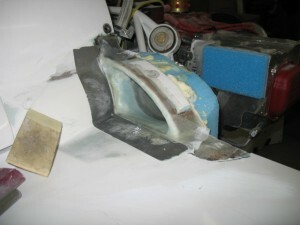 The first step is to reattach part of the original fairing. Foam was bonded to the inlets, shaped for glassing. There is an Alum ring (which you will see later which will be used as a support for a silicon vibration isolation tube. The inlets both have about 12 sq in per side. It should be plenty for cooling as it is about the same as my plane and my cooling works exceedingly well. Tomorrow, I will reshape this area, and start working on the inlet tube to the engine. I feel shaping of the inlets is the hardest part of the down draft cooling. The rest of the work is very simple.